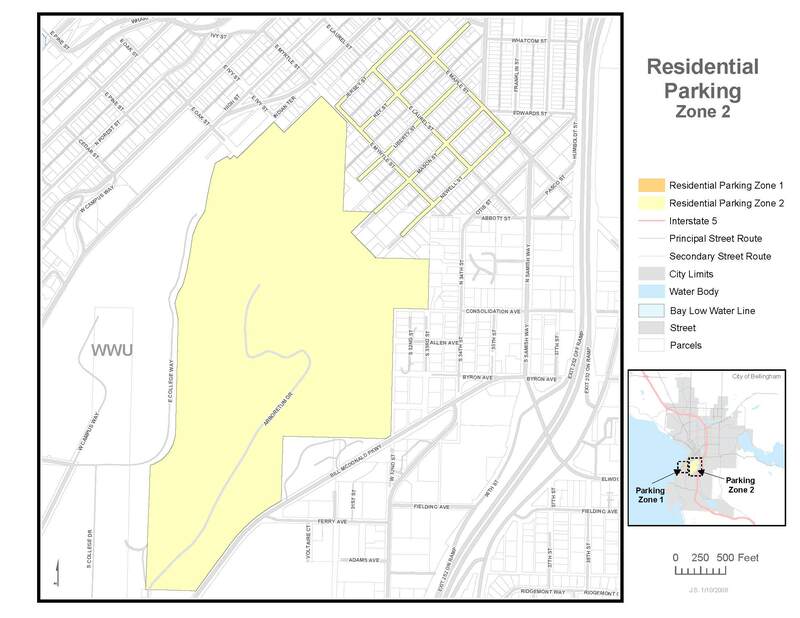 11.38.010 Residential parking zone established. The area including one block of Morey Avenue northwest of Highland Drive, Forest Street between Olive Street and Cedar Street, all of Cedar Street, N. State Street between Cedar Street and the southern end of the 400 block of N. State Street, Garden Street between Olive Street and Beech Street, the 300 and 400 blocks of N. Garden Street, and Olive, Palm, Bryant, and Sycamore Streets between Forest Street and Garden Street, as depicted on Map 11.38.010(A), is a residential parking zone, to be known as Residential Parking Zone 1; and the areas bounded by Maple Street, Newell Street, Jersey Street and the Sehome Hill Arboretum, including Maple, Newell, Mason, Liberty, Laurel, Key, Myrtle, Ivy and Jersey Streets, and Key Street between Maple Street and Chestnut Street, as depicted on Map 11.38.010(B), is a residential parking zone, to be known as Residential Parking Zone 2. 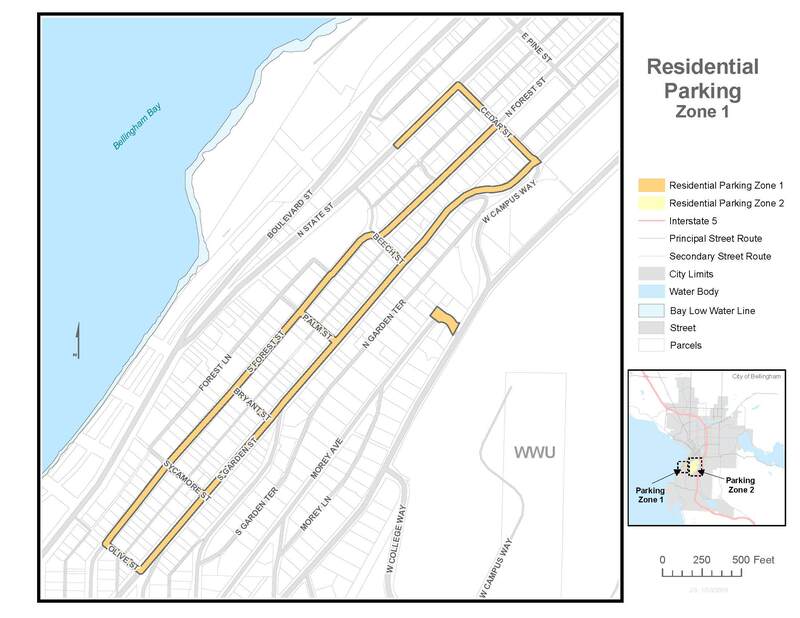 A property shall be included within a residential parking zone only if its address includes, or access to the property is via, a street which is within the zone. On and after September 22, 1997, it shall be a parking infraction to park between the hours of 8:00 a.m. and 5:00 p.m. (8:00 a.m. and 8:00 p.m. for Morey Avenue only) Monday through Friday, except holidays, on any street within a residential parking zone unless the parked vehicle displays a valid residential parking permit or visitor’s parking permit for the residential parking zone in which it is parked. A residential parking permit or visitor’s parking permit shall only be valid if the vehicle is parked on or within a one block radius of the city block for which the vehicle is registered. A residential parking permit shall only be valid if displayed upon the rear bumper on the left-hand side of the resident’s vehicle or in the lower left-hand corner of the rear window of the resident’s vehicle. [Ord. 2008-09-086; Ord. 2007-10-079; Ord. 2002-10-068; Ord. 2001-08-058; Ord. 1999-04-020].